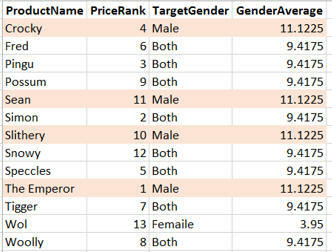 What we're aiming for: showing the average price for each product by its target gender. You'll need to import this table into your model. 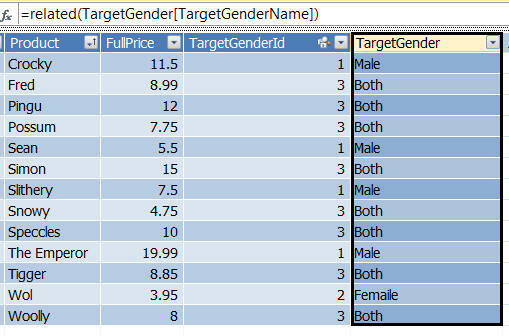 Change the properties of the Product table to include the TargetGenderId column, and link the two tables together by this column. It's all good practice! 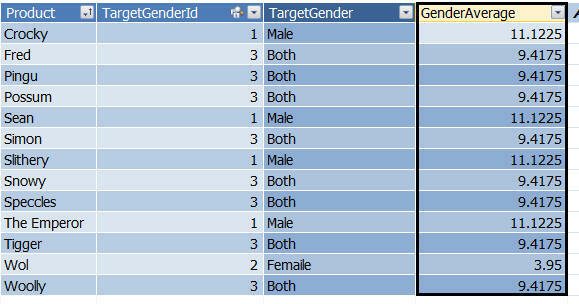 Create a calculated column to show the target gender within the products table. For Crocky, the FILTER function will return the set of rows shown here shaded: those for which the target gender equals this individual product's target gender. The formula will then take the average price from this set of rows. The usual caveats apply: remember to create a calculated column and not a measure, and bear in mind that the database engine will calculate the results more efficiently than the above table would suggest. Finally in this look at the EARLIER function, I'll show how to band rows together.